The Grand Rapids, Grand Haven & Muskegon (GRGH&M) Railway was part of a network of electric railroads that spread across southern Michigan in the early part of the 20th century. For nearly 30 years, the railway connected Grand Rapids with Muskegon and Grand Haven on the Lake Michigan shore. The fast and frequent service it offered transformed life in Coopersville, Nunica, Berlin (now Marne), Fruitport, and other smaller communities along the way. In addition, the railway and the boats of the Goodrich and Crosby steamship lines provided an overnight connection with Chicago and Milwaukee. Moving both people and freight, this interurban had an important impact on both local and regional economies. 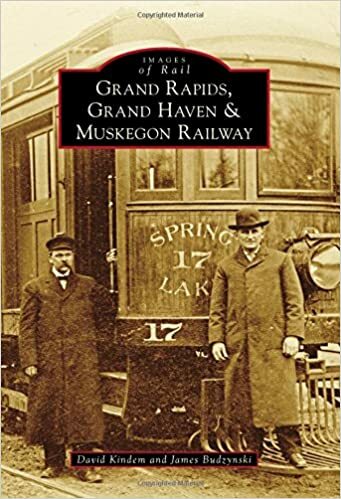 Images of Rail: The Grand Rapids, Grand Haven & Muskegon Railway traces the history of the electric interurban in West Michigan, telling the story of the growth, operation, and eventual demise of an important electric railway in the region.